When we counsel clients in difficult relationships, one of the curious patterns we see is a tendency toward impulsivity. We've seen it so often, in fact, that we've begun to believe it may be the most malignant of all relationship behaviors. 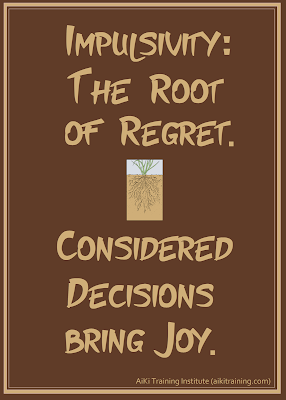 Impulsivity: The Root of Regret. Impulsive people say and do hurtful things to the people they love, and tend to suffer problems at work, with law enforcement, and in completing projects. 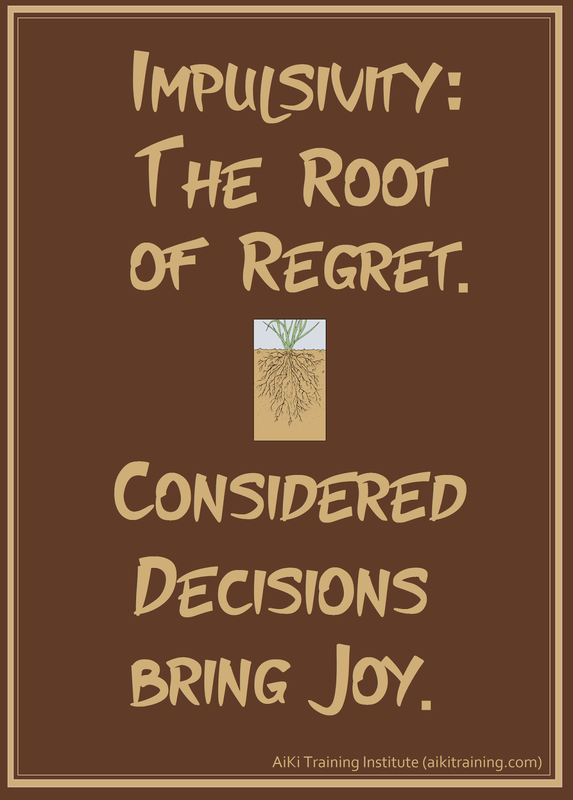 If you look back at your own regrets, you'll likely find that nearly all of them arose out of an impulsive act. When people are able to master their impulsivity, wonderful things start to occur in their marriages: Escalation ends, hearing happens, defensiveness discontinues, and intimacy is initiated. Bottom line? Slowing down is a fast fix for many relationship problems. And it's a fairly easy correction: Just take a deep breath, think carefully before you speak, and watch intimacy grow! We welcome intelligent discussion and serious questions. Thank you for helping us raise the level of discourse in the world. The AiKi Relationship Training Institute is the research, publishing, coaching, and speaking affiliate of Allied Family Therapy. AiKi Relationship Training uses a martial-arts metaphor to coach relationship, communication, and life skills. Visit our digital library, schedule training events, and sign up for our newsletter to receive free therapeutic advice for improving your relationships! Get AiKi Relationship Training tools to improve your relationship! Subscribers get freebies: e-books, discounts, and tools for improving emotional intimacy. Copyright 2014 et. seq, by AiKi Relationship Training Institute. Awesome Inc. theme. Theme images by blue_baron. Powered by Blogger.